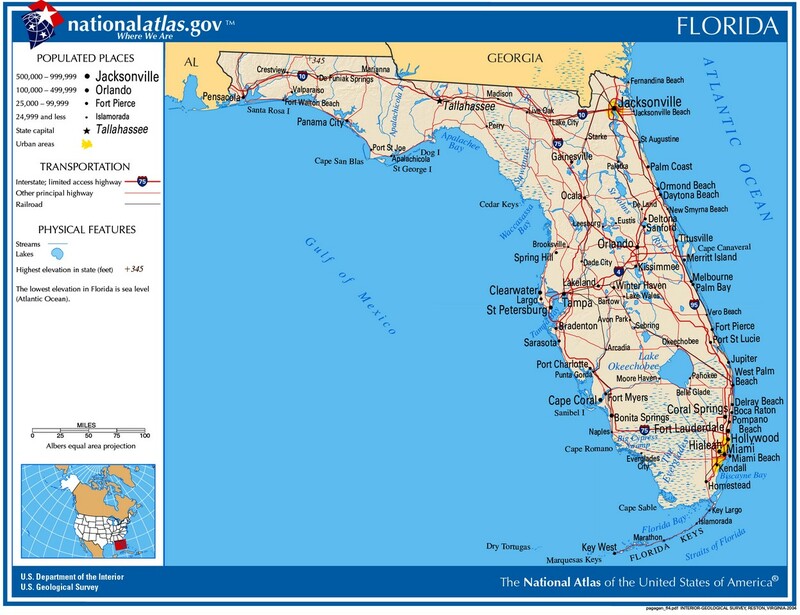 On March 3, 1845, Florida became the 27th state of the United States of America. Its first governor was William Dunn Moseley. The history of Florida can be traced back to when the first Native Americans began to inhabit the peninsula as early as 14,000 years ago. They left behind artifacts and archeological evidence. Written history begins with the arrival of Europeans to Florida, beginning with the Spanish explorer Juan Ponce de León in 1513. From that time of contact Florida has had a long immigration, including French and Spanish settlement during the 16th century, as well as entry of new Native American groups migrating from elsewhere in the South. From the beginning of the 18th century, various groups of Native Americans, primarily Muscogee people (called Creeks by the English) from north of present-day Florida, moved into what is now the state. The Creek migrants included Hitchiti and Mikasuki speakers. There were also some non-Creek Yamasee and Yuchi migrants. A series of wars with the United States resulted in the removal of most of the Indians to Oklahoma and the merging of the remainder by ethnogenesis into the current Seminole and Miccosuki tribes of Florida. The Adams--Onis Treaty of 1819, also known as the Transcontinental Treaty or the Purchase of Florida, was a treaty between the United States and Spain in 1819 that gave Florida to the U.S. and established a boundary between the U.S. and New Spain (present-day Mexico). 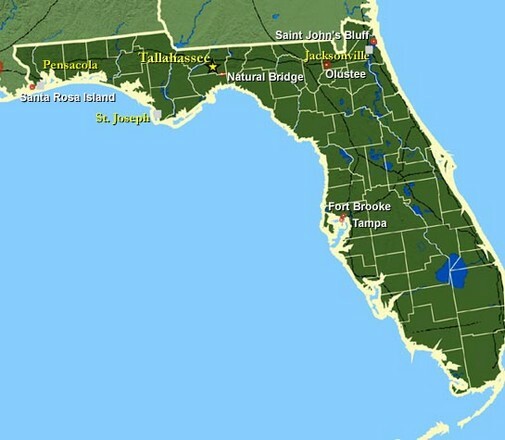 Florida had been under colonial rule by Spain and Great Britain during the 18th and 19th centuries before becoming a territory of the United States in 1822. Two decades later, in 1845, Florida was admitted to the Union as the 27th U.S. state. (Right) John Milton (April 20, 1807–April 1, 1865) was known as the War Governor of Florida (October 7, 1861–April 1, 1865). Disgusted with the Union, and on the brink of the Confederate surrender, Milton stated that "death would be preferable to reunion." Florida served the Confederate States of America from the beginning of the American Civil War (1861–1865). Following Abraham Lincoln's election in 1860, the state of Florida joined other Southern states in declaring secession from the Union, the third of the original seven states to do so. With a small population, Florida would contribute more goods and supplies to the Confederate cause than manpower. It produced large amounts of sustenance and its large coastline made it difficult for Union Navy efforts to curb blockade runners bringing in supplies and material from foreign markets. Despite their limited success in controlling coastal fortifications, Florida proved vital to the Confederate war effort in other ways, including their supply of beef and the production of salt. Unfortunately, their resources were overburdened like so many other states in the South. The continuously changing nature of control in the state caused constant uncertainty for both the population and the limited number of troops available to defend such a large state. With such demands on both the population and the Confederate forces, bands of deserters were free to operate against Confederate authority in parts of the state. From its early Spanish and British settlers, slavery was tolerated in present-day Florida. When Florida received statehood on March 3, 1845, almost half the state's population consisted of enslaved African-Americans working on large cotton and sugar plantations, between the Apalachicola and Suwannee rivers in the north central part of the state. Like the people who held them, many slaves had arrived from the coastal areas of Georgia and the Carolinas. They were part of the Gullah-Gee Chee culture of the Lowcountry (region along the South Carolina coast). Others were enslaved African-Americans from the Upper South who had been sold to traders taking slaves to the Deep South. Florida held a convention to consider the issue of secession and on January 10, 1861, the measure passed. Fire-eater John Milton, consequently, became the 5th Governor of Florida on October 7, 1861. The catalyst for the secession of Florida was the election of Abraham Lincoln to the presidency of the United States in November 1860. Fearful that Lincoln and the Republican Party would seek to destroy the traditional economic and social order of the South, Florida secessionists, led by Governor Madison Starke Perry, called for the state to arm itself in preparation for secession from the United States and the creation of an independent Southern confederacy. The legislature met in regular session on November 26 and voted to call for the election of delegates to a state convention that would convene in January 1861 to decide for or against secession. Every delegate elected to the Convention of the People of Florida that assembled at Tallahassee on January 3, 1861, supported secession. Their main concern was not whether to secede, but when. The more moderate delegates, known as “cooperationists,” wanted to delay secession until several Southern states were ready to leave the Union together. Radical or “fire-eater” delegates demanded Florida’s immediate withdrawal from the United States. The radicals won the debate: the convention passed an ordinance of secession on January 10. The next day, the convention assembled at the state capitol to sign the Ordinance of Secession, which declared Florida’s decision to dissolve its association with the United States and become “a Sovereign and Independent Nation,” making Florida the third state to divorce the Union and one of the founding members of the Confederacy. Florida sent a three-man delegation to the 1861-62 Provisional Confederate Congress, which first met in Montgomery, Alabama, and then in the new capital of Richmond, Virginia—Jackson Morton, James Byeram Owens, and James Patton Anderson, who resigned April 8, 1861, and was replaced by George Taliaferro Ward. Ward served from May 1861 until February 1862, when he resigned and was in turn replaced by John Pease Sanderson. Prior to April 15, 1861, seven Southern states, South Carolina, Mississippi, Florida, Georgia, Alabama, Louisiana and Texas, had seceded from the Union. On April 15, 1861, Lincoln stated in his Call For Troops that the only cause of the Civil War was secession in the Southern states, and that troops were being called upon in order to "suppress the rebellion" and force the states back into the Union. Just 2 days after Lincoln's Call for Troops to raise an army and invade the South, Virginia seceded (April 17), followed by Arkansas, North Carolina and Tennessee. Kentucky, meanwhile, refused to recruit a single soldier for Lincoln's "wicked cause," and Maryland, a free state, was invaded by U.S. troops and placed under martial law, while Delaware, though of divided loyalty, did not attempt it. In Missouri, on October 31, 1861, a pro-CSA remnant of the General Assembly met and passed an ordinance of secession. Though Florida voted overwhelmingly to secede, there was, however, a small pro-Union and anti-Confederate minority in the state, an element that grew as the war progressed. While most Floridians supported secession in 1860–1861, a number still exhibited a lingering loyalty to the United States. As the war progressed, anti-war and pro-Union sentiment in the state increased. 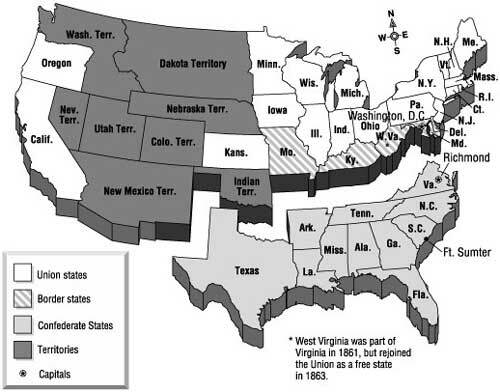 Some may have originally opposed secession, while others became demoralized and disenchanted with Confederate policies. Conscription alienated many, as did the Impressment Act, which authorized the government’s seizure of food and other goods. Widespread shortages and long casualty lists added to the discontent. As anti-war and pro-Union sentiment increased, some Unionists fled to the protection of Federal military forces. Others hid in remote areas of the state, their numbers augmented by deserters who grew in number as the war progressed. In addition to the white population, large numbers of Florida slaves, with no loyalty to the Confederacy, likewise fled to the protection of Union forces. The strongest example of militant Unionism in Florida was the formation of the 1st and 2nd Florida Union Cavalry Regiments. These units took part in numerous skirmishes during 1864–1865. Though not all Florida Unionists demonstrated their opposition to the Confederacy to that extent, it appears obvious that, while many Floridians remained loyal to their new nation until the final surrender, others had long since abandoned the cause and looked to the Union victory with satisfaction or relief. See also Florida in the American Civil War (1861–1865): A History and Floridians and the Civil War. According to the 1860 U.S. census, Florida had a free population of 78,679 and an additional slave population of 61,745, making it the least populated state in the Confederacy. During the Civil War in Florida (1861–1865), key Union objectives were to: blockade the Florida coast; secure ports and forts; then launch operations inland by both land and river to disrupt Confederate war making capability; capture and secure depots, bridges, rivers, towns and cities; recruit Unionists and blacks for the Union military; and to capture the prized state capital in Tallahassee. Florida raised more than 15,000 troops for the Confederacy, which were organized into 12 regiments of infantry and 2 of cavalry, several artillery batteries, as well as militia and reserve units. While approximately 1,000 Floridians served in the Union's 1st and 2nd Florida Cavalry Regiments, nearly 1,000 escaped slaves and free blacks from Florida joined Union (colored) regiments in South Carolina. A compilation made from the official rosters of the Confederate Armies as they stood at various battles, and at various dates covering the entire period of the war, shows that Florida kept the following number of organizations in almost continuous service in the field: 10 regiments and 2 battalions of infantry; 2 regiments and 1 battalion of cavalry; and 6 batteries of light artillery. During the course of the Civil War, although Confederate records are notoriously incomplete, Florida suffered nearly 2,500 in killed and thousands more in wounded, according to Dyer, Frederick H., A Compendium of the War of Rebellion (1908). Additional sources, however, estimate that Florida suffered as many as 5,000 in killed. Nevertheless, Dyer (Compendium) and Fox (Regimental Losses) are considered eminent scholars in their respective fields and are cited and quoted by most historians and scholars. See also Total Union and Confederate Civil War Casualties in Killed, Mortally Wounded (Dead), and Wounded. According to both The Florida Civil War Heritage Trails (produced by the Florida Association of Museums) and the University of South Florida Graduate School (Scholar Commons), "Approximately 16,000 Floridians fought in the Civil War, with 15,000 serving in the Confederate Army. Of these, 2,309—or 14.4%—deserted. Nearly 5,000 Floridians were killed in battle. Approximately 31% of those Floridians that served in either the Confederate or Union Armies met a violent end." Neither, however, apply citations or include Florida's total number of African-Americans who served in the Union military. See also African-American Military Units in Florida during the Civil War (1861–1865). The Civil War resulted in numerous battles and skirmishes in Florida, including the Battle of Santa Rosa Island, October 9, 1861; Battle of Tampa (aka Yankee Outrage at Tampa), June 30-July 1, 1862; Battle of St. John’s Bluff, October 1-3, 1862; Battle of Fort Brooke (Tampa), October 16-18, 1863; Battle of Olustee (aka Battle of Ocean Pond), near Lake City, February 20, 1864; Battle of Gainesville, August 17, 1864; Battle of Marianna, September 27, 1864; Battle of Fort Myers, February 25, 1865; and Battle of Natural Bridge, March 6, 1865. The only major battle in the state, however, was the Battle of Olustee near Lake City. Although Florida was the least populated Southern state and host to only one major battle, Florida units fought in each of the ten bloodiest and costliest battles of the American Civil War. Notable Floridians who served the Confederacy included Generals William Loring and Edmund Kirby Smith, who held the same rank as General Robert E. Lee, Secretary of the Navy, Stephen Russell Mallory, and David Levy Yulee, who was the first Jewish member of the United States Senate. Florida's prominent participants also included women, African-Americans, Hispanics, and from young boys and girls to old men and women. From the 1st Florida Special Cavalry Battalion, popularly known as the Cow Cavalry, to state militia and reserve companies, composed of young boys and old men, to the Florida Brigade, the entire Sunshine State was affected immensely by the Civil War. See also Notable Citizens and Generals of Florida in the Civil War (1861-1865) and Floridians and the Civil War. While the only all Florida command, known as the Florida Brigade or Perry's Brigade, received praise from General Lee for its stalwart performance at the Battle of Chancellorsville, it also sustained a staggering 65% casualties (second highest of any brigade engaged at Gettysburg) during its unwavering advance into enemy shot and shell during the Battle of Gettysburg. Since neither army aggressively sought control of Florida, many of Florida's best home-raised troops instead served in Virginia in the Army of Northern Virginia under Brig. Gen. Edward A. Perry and Col. David Lang. While the Florida Brigade fought in many of Robert E. Lee's campaigns, and twice charged Cemetery Ridge at Gettysburg, including supporting Pickett's Charge, several Florida units fought in many of the ten deadliest and bloodiest battle of the war. Numerous Florida units suffered high casualties during battle. The 4th Florida Regiment, Preston's Brigade, Breckenridge's Division, during the Battle of Stones River, Tennessee, suffered 194 casualties: 34 killed, 129 wounded, and 31 missing. The 2nd Florida Regiment, at the Battle of Fair Oaks, Virginia, sustained 198 casualties: 37 killed, 152 wounded, and 9 missing. During the Seven Days Battles, near Richmond, Virginia, the 2nd Florida Regiment suffered a total of 137 casualties: 23 killed and 114 wounded. At the Battle of Olustee, Florida, the 2nd Florida Battalion suffered 109 casualties: 12 killed, 95 wounded, and 2 missing. The 6th Florida Regiment, during the Battle of Chickamauga, Georgia, suffered 165 casualties: 35 killed and 130 wounded. Although early in the Civil War the bulk of Florida’s military had been transferred to both western and eastern theaters to confront the major Union threat, Floridians moved quickly to adapt, improvise, and overcome the dominant Union presence that confronted the Sunshine State. The state had to rely on its motley combination of ill-trained and ill-equipped militia, reserve, home guard and partisan forces. Florida’s newly formed force that had been called upon to stave off any attack from the formidable United States military consisted of numerous 13 year old boys and 75 year old seniors, who had little, if any, formal military training. While familiarity of terrain is appreciated in battle, it was one of the few advantages that Florida enjoyed. 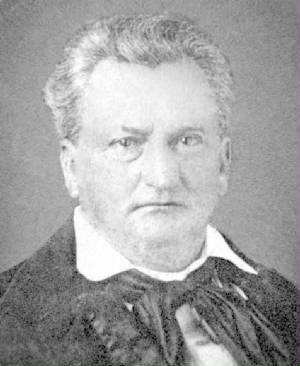 Florida Governor John Milton (April 20, 1807 – April 1, 1865), an ardent secessionist, throughout the war stressed the importance of Florida as a supplier of goods, rather than personnel, with Florida being a large provider of food (particularly beef cattle) and salt for the Confederate Army. The thousands of miles of Florida coastline proved a haven for blockade runners and a daunting task for patrolling Federal warships. However, the state's small population (last in size in the Confederacy), relatively remote location, and meager industry limited its overall strategic importance. Nevertheless, Milton worked feverishly to strengthen the state militia and to improve fortifications and key defensive positions. Florida being an important supply route for the Confederate Army, Union forces operated a blockade around the entire state. Union troops occupied major ports such as Cedar Key, Jacksonville, Key West, and Pensacola. Confederate forces moved quickly to seize control of many of Florida's U.S. Army forts, succeeding in most cases with the significant exceptions of Fort Zachary Taylor and Fort Pickens, which stayed firmly in Federal control throughout the war. After Florida seceded from the Union, state officials quickly ordered their troops to seize key Federal forts and arsenals throughout the state, including Fernandina, St. Augustine and Chattahoochee. Pensacola Bay with its safe harbor and adjoining navy yard complete with docking, supply, and shipbuilding facilities was their next target. U.S. Army Lt. Adam Slemmer realized that he could not defend all four forts under his command and therefore concentrated all his troops at Fort Pickens on Santa Rosa Island. On January 28, 1861, a truce was reached that stated that the South would not attack and the fort would not be reinforced. The First Florida Infantry Regiment was the initial military unit raised in the state, and it immediately joined Confederate forces in April 1861 in their siege of Fort Pickens at Pensacola. In July, the Second Florida Regiment formed and left the state for Virginia. Florida produced two more infantry regiments, a cavalry battalion, and a number of independent infantry, artillery, and cavalry companies in 1861. By the end of the year, some 5,000 Floridians had joined the military forces of the Confederacy. While the vast majority served in the Confederate Army, a small number served in the Confederate Navy under the command of Secretary of the Navy Stephen Russell Mallory (one of Florida’s prewar senators). Mallory would serve as the Confederate Secretary of the Navy for the duration of the war. Following the attack of Fort Sumter, April 1861, Union forces broke the truce and reinforced Fort Pickens, making it their headquarters in Florida. Without Fort Pickens, the Confederate occupation of Pensacola was tenuous. The operations of the U.S. naval blockading squadrons created unrest along the gulf coast. On October 9, 1861, Confederate Gen. Braxton Bragg ordered an attack on the fort after a Federal boat party destroyed the Confederate privateer Judah at the Pensacola Navy Yard. In May 1862, the Confederates decided to abandon the harbor to Union control. In early 1862, the Confederate government recalled General Braxton Bragg's small army from Pensacola following successive Confederate defeats in Tennessee at Fort Donelson and Fort Henry and sent them to the Western Theater for the remainder of the war. The only Confederate forces remaining in Florida at that time were a variety of independent companies, several infantry battalions, and the 2nd Florida Cavalry. They were reinforced in 1864 by troops from neighboring Georgia. After major Confederate defeats in the Western Theater in 1862, the Confederacy required every available unit to confront the advancing Union threat. General Robert E. Lee, having been appointed by Confederate President Jefferson Davis to command Confederate forces along the lower Atlantic Coast, including Florida, advocated the transfer of many Florida units to assist in the defense of the Western Theater. With the abandonment of Confederate defenses, particularly in northeast Florida, it was an open invitation for a Federal invasion. In 1862, Union forces, launching a series of attacks on Florida, landed on Amelia Island and captured Fernandina on March 4, 1862. A week later, St. Augustine fell to the North, whose troops then occupied Jacksonville on March 12. Said actions went unopposed as Confederate forces had previously been withdrawn. The Federals, however, had underestimated General Lee's strategy. Lee, who was not yet a famous or popular general, believed that an interior defense was the only viable strategy given Union naval superiority and the small number of Confederate troops available for the defense of Florida’s immense coastline. During the Civil War in Florida (1861-1865), key Union objectives were to: blockade the Florida coast; secure ports and forts; then launch operations inland by both land and river to disrupt Confederate war making capability; capture and secure depots, bridges, rivers, towns and cities; recruit Unionists and blacks for the Union military; and to capture the prized state capital in Tallahassee. From 1862 to 1864, while Florida militia and reserves were the principal forces that stood between the Union and its objectives, Union forces made numerous attempts to achieve every stated objective, only to be partially successful. In 1864, President Lincoln, through official correspondence, stated clearly to the Federals that capturing the Florida capital was now his primary objective, because elections and Reconstruction depended on it. See also Florida in the American Civil War (1861-1865): A History. Florida met the Union incursions of 1862 to 1865 with only a handful of state and Confederate troops. Most of the state’s Confederate soldiers never fought on their home soil. 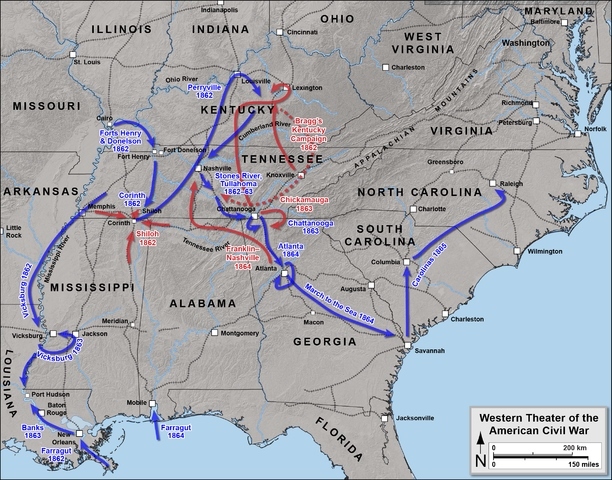 Instead, their regiments served in the Confederate armies deployed in the major theaters of operations in Virginia and the West (Tennessee, Mississippi, and Georgia). The Second Florida saw its first actions in Virginia as one of the defending regiments in the siege of Yorktown in April 1862 and in May during the Battle of Williamsburg, where the regiment lost its commander, Colonel George T. Ward, who was killed during the fighting. Following the Confederate withdrawal from the Virginia Peninsula and the ensuing battles on the outskirts of Richmond, the Second Florida was joined in Virginia by the Fifth and Eighth Florida infantry regiments. All three Florida regiments fought in the Second Battle of Manassas (or Second Bull Run) in August 1862 as part of the Army of Northern Virginia under General Lee. In September, the Florida regiments moved with Lee’s army into Maryland and engaged in what has been called the bloodiest single day in U.S. history, the Battle of Antietam, on September 17, 1862. The “Florida Brigade” was initially composed of the Second, Fifth, and Eighth Florida Infantry Regiments and attached to the Army of Northern Virginia, under the command of Brigadier General Edward A. Perry, a future governor of Florida. 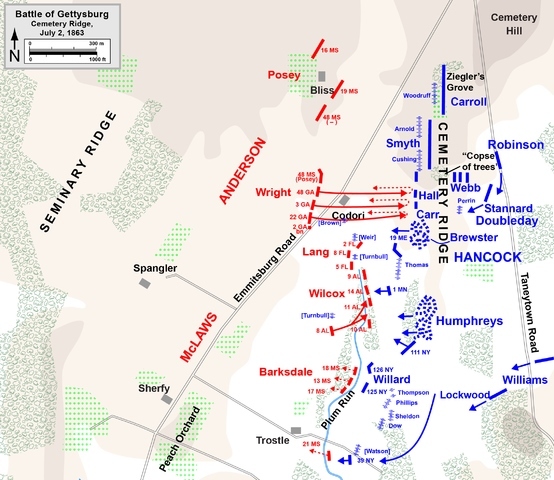 During 1863, the Florida Brigade participated in the Army of Northern Virginia’s greatest triumph and its worst defeat: the Battle of Chancellorsville on May 3 and the Battle of Gettysburg on July 1-3. Decimated in the fighting at Gettysburg, the Florida Brigade remained a unit on paper but battlefield losses reduced the brigade to little more than the size of one regiment. In 1864, the Ninth, Tenth, and Eleventh Florida infantry regiments joined the Florida Brigade in Virginia. The reinforced brigade, now under the command of General Joseph Finegan, fought in the battles of attrition that characterized General Ulysses S. Grant’s campaign against the Army of Northern Virginia in the summer of 1864. Retreating with the remnants of Lee’s army after the collapse of the Confederate positions around Richmond, the surviving members of the Florida brigade surrendered along with the rest of the Army of Northern Virginia at Appomattox on April 9, 1865. During the Battle of Gettysburg, July 1863, Brig. Gen. Edward Aylesworth Perry was stricken with typhoid fever, and brigade command devolved to Colonel David Lang of the 8th Florida Regiment. Florida was represented at Gettysburg by an all Florida brigade of three infantry regiments in Maj. Gen. R. H. Anderson’s Division of A. P. Hill’s III Army Corps. By the summer of 1863, these soldiers were seasoned veterans of the Army of Northern Virginia. The 2nd Florida Infantry had experienced heavy combat in several battles during the Peninsula Campaign of 1862 (aka Peninsular Campaign). The regiment fought at Yorktown, followed by a delaying action at Williamsburg where the regiment's first colonel was killed. At a swampy Virginia crossroads called Seven Pines, the 2nd, then attached to Brig. Gen. Samuel Garland's brigade, fought a brutal contest through mud, heavy vegetation and waist deep water. There, the 2nd Florida gained everlasting glory when it charged and captured a battery of Federal artillery while sustaining over 50% casualties. After the Seven Days Battles, the battered 2nd was joined by the 5th and 8th Florida Infantry regiments. The Floridians bravely fought at Second Manassas, Sharpsburg, Fredericksburg and Chancellorsville, and continually proved themselves to be tough soldiers full of courage and fight. Following the battle of Sharpsburg, Maryland, in September 1862, the three regiments were consolidated into a single Florida brigade under Brig. Gen. Edward Aylesworth Perry of Pensacola. Perry’s Brigade marched towards Gettysburg on July 1, the first day of the battle, and was not engaged. Anderson’s Division was assigned a position along Seminary Ridge. Cadmus Wilcox’s Alabama Brigade was on the Floridians’ right and Rans Wright’s Georgia Brigade occupied the ground on its left. Early the next morning, Colonel Lang placed his men behind a stone wall on the east edge of the woods on Abraham Spangler’s farm (the remnants of this wall can be seen today). About 1:00 P.M. on July 2, Union General Daniel E. Sickles advanced a small reconnaissance force consisting of the 3rd Maine and an elite unit, the 1st U.S. Sharpshooters. These troops crossed the Emmitsburg Road and probed the woods to Perry's Brigade's right. There, they encountered Wilcox’s Brigade's 11th Alabama and were repulsed after a rather brisk fight. Lang was instructed to aid Wilcox if he requested support. Although this proved unnecessary, stray shots from the skirmish wounded a few men in Perry's Brigade. "About 4:30 p.m., Longstreet having advanced to Wilcox, he swung his right forward and advanced. As soon as his left reached my right, I conformed to the movement, and advanced at the double-quick upon the strongly fortified position in front, exposed to artillery and musketry fire from the start. Our men suffered terribly, but advanced nobly to the charge. About half way across the field the enemy had a line of batteries strongly supported by infantry. We swept over these, without once halting, capturing most of the guns and putting the infantry to rout with great loss. Indeed, I do not remember having seen anywhere before, the dead lying thicker than where the Yankee infantry attempted to make a stand in our front." At the Emmitsburg Road, Perry's Brigade engaged the 1st Massachusetts, who was acting as skirmishers for Carr’s Brigade, the rightmost unit of Union General A. A. Humphrey’s Division. Behind them, along the main line, Lang’s men fought and outflanked the 26th Pennsylvania and 11th Massachusetts, repulsing them and inflicting terrible losses. The Florida Brigade crashed through the field beyond the Emmitsburg Road and down a gentle slope to the bottom of a ravine through which the upper branch of Plum Run flowed. Here Lang paused his battle-worn men and attempted to re-form the brigade’s line. Shells and grapes from Federal cannon ceaselessly pounded their ranks. Ahead, Cemetery Ridge loomed up and directly in front. It was seemingly theirs for the taking, but Lang and his boys still had one more force to contend with, the 19th Maine Infantry regiment. The 19th Maine had been directly placed in position on Cemetery Ridge by none other than Union Maj. Gen. Winfield Scott Hancock, commander of the Federal II Corps. Colonel Francis Heath had his men lie down flat on the ground to avoid exposing them needlessly to Confederate artillery fire. When the Floridians advanced across the Emmitsburg Road they repulsed a mob of fleeing soldiers from Humphrey’s Division, which was directly in front of them. These panicked-stricken soldiers ran over top of Colonel Heath’s regiment and attempted to rally in its rear. In the meantime, Heath waited until the Floridian’s line of battle was well within effective musket range and then he ordered his 400 Mainers to stand and fire. He gave specific orders for his men to shoot the color bearer of one of the Florida regiments who was advancing in front of his brigade and seemed to be guiding it. The color bearer was so close that Colonel Heath could plainly distinguish the young man’s features; years later Heath recalled the determined look in the color bearer's eyes. His men fired and the colors went down. The Floridians halted and the two lines of battle exchanged volleys at a range of less than fifty yards. By this time, the Confederate ranks were thin. The brigade had advanced almost a mile from its starting position in Spangler’s Woods. It has advanced under punishing artillery fire while pushing back several lines of blue-clad infantry. Lang's regiments had sustained heavy losses, with many company commanders killed or seriously wounded, and the entire color guard of its center regiment, the 8th Florida, casualties. A fresh battery of Federal artillery unlimbered on Cemetery Ridge, sending shotgun-like blasts of canister fire into the Florida Brigade. It was then that Colonel Lang was notified that a Federal force had pushed back the Confederate brigade on his right and was threatening to cut off his line of escape. Fearing his force was about to be surrounded, Lang ordered his three regiments to retreat to the Emmitsburg Road. Finding no safe place to re-form there, the brigade retired to its original position. In the hasty retreat the colors of the 8th Florida were left on the field and picked up by Sgt. Thomas Horan of the 72nd New York, who later would receive the Medal of Honor for the capture. This flag survives and is preserved at the Museum of Florida History in Tallahassee. The next and final day, July 3rd, General Lee planned to attack again. This time, he would head straight for the Union center ("The Angle"), which he felt might be weak because the Federals had moved troops to re-enforce the flanks of their line. Maj. Gen. George E. Pickett's all-Virginia division spearheaded the main assault. 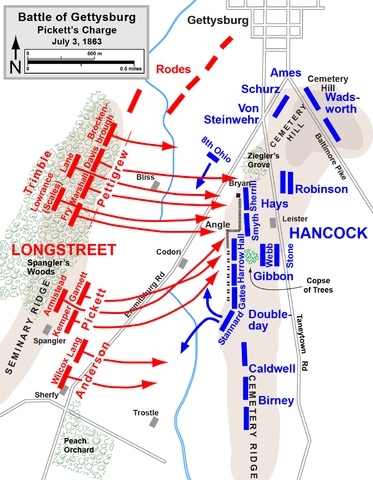 Attached to Wilcox’s Brigade, Lang's command was to advance as supports to Pickett's column. At about 1:00 P.M., the great cannonade intended to soften up the Federal center began. The Floridians were forced to lay prostrate for hours under the hot summer sun, surrounded by booming artillery pieces, while tons of lead flew through the air only inches above their heads. At last, the artillery fire slackened and the Virginians advanced, over Lang’s prostrate men, disappearing into the noise, smoke and fight on Cemetery Ridge. About 20 minutes after Pickett advanced, the order arrived for Wilcox’s command to advance. The Floridians went over the wall and once again moved eastward at quick step. From the start, the brigade was subjected to long range artillery fire from both Little Round Top and Cemetery Ridge. The fire turned to canister and musketry as the Confederates crossed the Emmitsburg Road and approached the main Union battle line. A dense pall of smoke clung to the ridge, and the brigade drifted away from its intended direction. 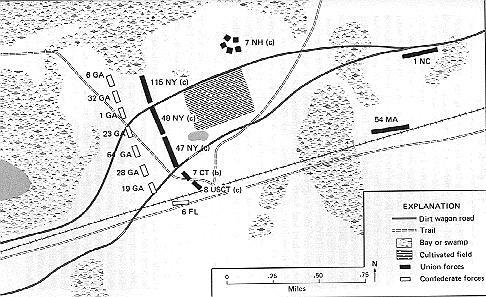 Instead of following Pickett’s men, the supporting column marched to its right, just slightly south of the place the Floridians had fought the previous day. In the confusion along the base of the ridge the 16th Vermont Regiment, having just flanked one of Pickett’s brigades and sent it reeling with great loss, turned about-face and crashed headlong into the left flank of the 2nd Florida. This was simply too much for the regiment to withstand. The 2nd Florida’s color bearer was wounded and gave his banner to another soldier to carry, but the new bearer advanced only a few more yards before he surrendered. The brigade was forced to retreat once again, and most of the 2nd Florida ended up as prisoners. The regiment's battle flag, a beautiful silk banner with a unique sunburst design sewn upon it, was turned in to Federal army headquarters for record of its capture. It was supposedly exhibited for a time in Chicago and then sent back to Philadelphia. After 1863 the flag mysteriously vanished from all records and has never been located. After Lee’s army had begun the withdrawal from Gettysburg and was in retreat towards the Potomac River, Colonel Lang tallied his losses and recorded that 455 out of the 700 men of Perry’s Brigade were killed, wounded or missing. This represents the highest casualty rate (65%) sustained by any brigade of the Army of Northern Virginia at Gettysburg. The 26th North Carolina Infantry, however, suffered 80% casualties which is the highest casualty rate of any regiment (North or South) at Gettysburg. Perry’s "intrepid little band of Floridians" never fully recovered from the harsh handling it received in Pennsylvania. The brigade received additional losses at Bristoe Station in October 1863. General Perry was severely wounded at the Wilderness during the Overland Campaign of 1864 and sent to the Confederate Invalid Corps in Alabama. The brigade was consolidated with other troops from Florida and the independent unit that had been Perry’s Brigade ceased to exist. Most of the men of the 5th and 8th Florida were captured at Sailor's Creek (aka Saylor's Creek) the following year, and Florida was represented by a mere fraction of its original fighting force at the surrender at Appomattox Court House. The hard-fought service of Florida units in Virginia had its counterpart in the West, where six Florida regiments fought as part of the Confederate armies engaged in battles for control of territory ranging from the Appalachian Mountains to the Mississippi River. Consisting of one cavalry regiment and five infantry regiments—about 6,000 out of the total of 15,000 Floridians who fought for the Confederacy during the war—the following Florida units saw service in the West: the First, Third, Fourth, Sixth, and Seventh infantry regiments, and the First Florida Cavalry Regiment. Men from the First Florida Infantry participated in the Battle of Shiloh on April 6-7, 1862, and the defense of Corinth, Mississippi, in May. All of the Florida units in the West during 1862-1863 eventually served with the Army of the Mississippi (later designated the Army of Tennessee) under General Braxton Bragg or in the Department of East Tennessee headed by General Edmund Kirby Smith, a native of St. Augustine, Florida. The First and Third Florida infantry regiments participated in the Confederate invasion of Kentucky in August 1862 and joined with the Fourth Florida as part of the Army of Tennessee in the Battle of Murfreesboro from December 31, 1862, through January 2, 1863. A defeat for the Confederacy, Murfreesboro marked the beginning of a series of Union victories over the Confederate forces in the West during 1863. The Florida Brigade of the West (the combined First, Third, and Fourth infantry regiments) made up part of the Confederate army that failed to relieve the Confederate force besieged at Vicksburg, Mississippi: the city surrendered to General Grant on July 4, 1863, a disaster which severed the South west of the Mississippi from the rest of the Confederacy. All of the Florida regiments stationed in the West participated in one or more of the battles that raged around Chattanooga, Tennessee, from September through November 1863. The Sixth and Seventh Florida and the First Florida Cavalry joined the rest of the Florida Brigade at Chickamauga and fought alongside the Florida First, Third, and Fourth infantry regiments at Missionary Ridge. During the last year of the war, the Florida units in the West continued to serve with the Army of Tennessee as it fought in the defense Atlanta, attempted to recapture Nashville, and finally retreated into North Carolina, where General Joseph E. Johnston, the commander of the Army of Tennessee, agreed to surrender his forces to General William T. Sherman. The remnant of the Florida Brigade of the West laid down its arms with the rest of General Johnston’s army on May 4, 1865, at Greensboro, North Carolina. During the Civil War, Florida militia, reserve, and home guard companies, comprised primarily of individuals either too old or too young, or otherwise unable to serve in the regular military, took an active role in a number of battles and campaigns. The origins of the militia in Florida date from the Spanish period, making it the oldest in the present-day United States. 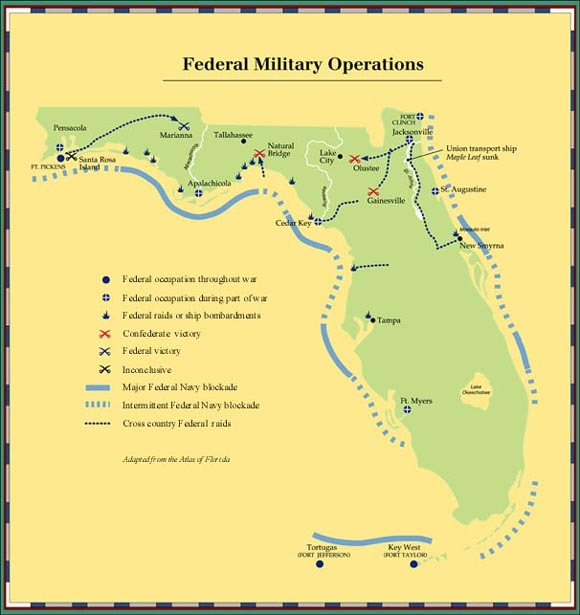 When Florida left the Union, volunteer units occupied Federal installations in the state. Most of these volunteers were eventually mustered into Confederate units, leaving the state militia system in a shambles and, in early 1862, it was disbanded. In 1864, the Confederate Congress authorized a new reserve force that led to the formation of the 1st Florida Reserves, which served until the war’s end. In December, the state legislature passed the first militia law in two years, placing all males between 16 and 65 in state service. At this stage of the war, however, it appears unlikely that any formal organization of these men took place. Consequently, at late-war engagements like Marianna and Natural Bridge, the militia and home guard companies that took part were informal, ad hoc organizations. Nonetheless, they fought and sometimes died in defense of their state. From 1862 until the conclusion of the Civil War in 1865, boys and old men, principally from Florida reserve and militia units, with their familiarity of terrain, were able to engage and thwart superior numbers from a well-trained Union army in many skirmishes and battles at multiple critical junctures throughout Florida. Most historians and writers, nevertheless, downplay the importance of each battle between the well-equipped Federals and the local Florida boys and old men (who were armed mainly with squirrel rifles and shotguns) by stating that Florida was insignificant and that the Regulars (U.S. Army) who engaged the boys and old-timers didn't have much to gain strategically -- even if they had swept the state unopposed -- because Florida held little value, in context, during the conflict. Oddly, to say the least, every Southern state capital east of the Mississippi fell under Union control during the Civil War, save one, the Florida capital at Tallahassee. Perhaps the young boys and senior citizens played a more significant role than some are willing to concede. Whether of strategic or symbolic value, the fact remains that the Union army and navy made numerous attempts, with clear and concise objectives, to capture and secure ports, rivers, bridges, depots and even the state capital, only to be forced to retreat time and again because of the actions of those young and old Floridians. So now what do you think about General Lee's decision to transfer the bulk of Florida's troops to other theaters of war? Beginning in 1862, growing public dissatisfaction with Confederate conscription and impressment policies encouraged desertion by Confederate soldiers. Several Florida counties became havens for Florida deserters as well as deserters from other Confederate states. Deserter bands attacked Confederate patrols, launched raids on plantations, confiscated slaves, stole cattle, and provided intelligence to Union army units and naval blockaders. Although most deserters formed their own raiding bands or simply tried to remain free from Confederate authorities, other deserters and Unionist Floridians joined regular Federal units for military service in Florida. Then, however, there were the partisans who operated as independent units and wreaked havoc on Union forces. John Jackson Dickison, aka The Swamp Fox, from Ocala, was the most prominent Confederate partisan leader in Florida, and the legendary Captain J.J. Dickison helped maintain Confederate control over north-central Florida during the war’s later years. When the war began, Dickison served in the Marion Artillery before recruiting a mounted company that became part of the 2nd Florida Cavalry. From 1863 until the war’s end, Dickison defended Florida’s interior against attacks from the Union occupied coast. To loyal Confederates his exploits reached near mythic proportions. In the spring of 1864, Dickison captured the Union outposts at Welaka and Saunders, and then ambushed and forced the surrender of the Union gunboat USS Columbine at Horse Landing. Of the 148 men aboard the Columbine, only 66 survived and the rest were killed. This was one of the few instances in which a Union warship was captured by land-based Confederate forces during the Civil War and the only known incident in US history where a cavalry unit sank an enemy gunboat. In August 1864, he drove off a Union cavalry force that had briefly occupied Gainesville, inflicting 302 Union casualties while his own unit suffered only 8 losses. Early in 1865, Dickison skirmished with Federal forces at Braddock’s Farm, where he shot and mortally wounded the commander of the enemy detachment. He then moved his force to the Gulf coast to meet another Federal threat, skirmishing with the Federals at Station Number 4. While Dickison’s efforts ensured that the interior of Florida remained in Confederate hands, he could do nothing to delay the inexorable collapse of the Confederacy, and he surrendered his command at Waldo on May 20, 1865. J.J. Dickison would die of natural causes on August 20, 1902. See also Notable Citizens and Generals of Florida in the Civil War (1861-1865) and Floridians and the Civil War. By 1864, however, there was little difference in the military situation in Florida from what it had been in the spring of 1862. The Union continued to control Key West, Pensacola, St. Augustine, and Cedar Keys—Federal troops occupied Cedar Keys as early as January 1862. Confederate strategy in Florida remained concentrated on blocking Union access to the interior, protecting the coastal salt works, and ensuring the supply of Florida beef cattle to the Confederate army. It was Florida’s importance as a food source for the Confederacy and its burgeoning significance in Northern presidential politics that led to the Union’s decision to launch what would prove to be its largest military expedition in the state during the war. On February 7, 1864, Federal troops once again captured Jacksonville. This time, however, the Federals were determined to hold the city and push into the interior. The objectives of the Union campaign were to gain control of agricultural resources (especially cotton, timber, lumber, and turpentine) in East Florida, recruit slaves for service as troops, interrupt the supply of Florida beef cattle to Confederate armies out-of state, disrupt the Florida railroad system, and facilitate the restoration of Florida to the Union. The last objective was the result of Florida’s potential as a source of electoral votes in the upcoming presidential election of 1864. If Florida could be restored to the Union before the Republican nominating convention, either President Lincoln, who would be running for reelection, or Secretary of the Treasury William P. Chase, who hoped to secure the Republican nomination himself, could benefit from Florida’s votes. In February 1864, Union forces moved into Florida at the behest of President Abraham Lincoln. Their immediate objective was to capture the state capital at Tallahassee; their ulterior motives were to help institute the President’s “10 percent” reconstruction plan for the return of the state to the Union. Federal forces intended to cut off Confederate supply lines and isolate Florida from the rest of the Confederacy. On February 20, Union and Confederate forces clashed at Olustee in what became the largest battle in Florida. The result was a Union retreat but at a great cost to Confederates. This victory put an end to Union efforts to organize a loyal Florida government in time for the 1864 election. At Olustee, in early 1864, Union forces under Brig. Gen. Truman Seymour launched an expedition into Florida to secure Union enclaves, sever Rebel supply routes, and recruit black soldiers. 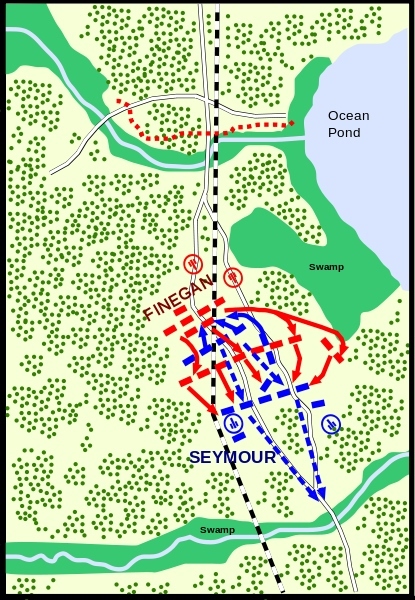 Seymour moved deep into the state, occupying, destroying, and meeting little resistance, but on February 20, he, with 5,500 Federals, approached Brig. Gen. Joseph Finegan’s 5,000 Confederates, consisting of Florida and Georgia troops, entrenched near Olustee. One infantry brigade advanced to engage Seymour’s advance units. The Union forces attacked but were repulsed. The battle raged, and as Finegan committed the last of his reserves, the Union line broke and began to retreat. Finegan did not exploit the retreat, allowing most of the fleeing Union forces to reach the fortifications around Jacksonville. The Confederates suffered 946 casualties, while Union losses were 1861. Union casualties were 203 killed, 1,152 wounded, and 506 missing, a total of 1,861 men—about 34 percent. Confederate losses were lower: 93 killed, 847 wounded, and 6 missing, a total of 946 casualties in all—but still about 19 percent. The Federals also lost six artillery pieces and 39 horses that were captured. Seymour's relatively high losses caused Northern lawmakers and citizens to openly question the necessity of any further Union involvement in militarily insignificant Florida, and many of the Federal troops were withdrawn and sent elsewhere. Throughout the balance of 1864 and into the following spring, the 2nd Florida Cavalry repeatedly thwarted Federal raiding parties into the Confederate-held northern and central portions of the state. Although in January 1865 Union General William T. Sherman issued a set of special orders that set aside a portion of Florida as a designated home for runaway and freed former slaves that had accompanied his command during its March to the Sea, these controversial orders were not enforced in Florida, and were later revoked by President Andrew Johnson. Florida remained relatively quiet until March 1865 when a Union force threatened to capture Tallahassee. On March 6, 1865, at the Battle of Natural Bridge, African-American soldiers, forming the 2nd and 99th United States Colored Troops (USCT), made 3 gallant assaults in an attempt to cross and secure the Natural Bridge, but they were met and repulsed by "boys and old men" from Confederate reserve and militia units. 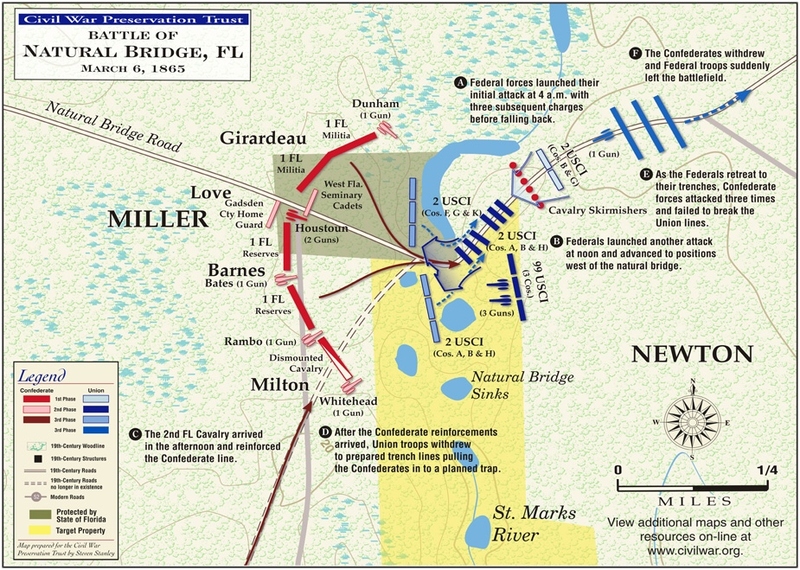 The Battle of Natural Bridge was fought in present-day Woodville, Florida, near Tallahassee, the state capital. Protected by breastworks, Confederate losses were 26, while the Union army suffered 148 casualties. Every Confederate state capital East of the Mississippi had already fallen, but the boys, including students from present-day Florida State University (then Florida Military and Collegiate Institute), and old men had saved the last Confederate state capital because they were the only force between the Natural Bridge, which traversed the St. Marks River, and Tallahassee. The following month, Lee would surrender to Grant. In 1865, Florida Governor John Milton, in his final message to the state legislature, said that Yankees "have developed a character so odious that death would be preferable to reunion with them." A single gunshot wound to the head, Milton was found dead in home on April 1, 1865. Whereas the masses were quick to pronounce that Milton had committed suicide, his death was never investigated. The president of the Florida Senate, Abraham K. Allison, was sworn in as Governor of Florida later that day. Next, Richmond, the Confederate capital, capitulated, followed by Lee's surrender on April 9. The governor's widely reported suicide had now become a footnote to the Lost Cause. But the cause of death remains speculation, however, because absent was a letter or note that generally accompanies a suicide, and while the firearm found near Milton's body was a shotgun, practically all firearm related suicides are the result of pistols. Milton, the fifth Governor of Florida, is buried at Saint Luke's Episcopal Cemetery in Marianna. In early May 1865, Bvt. Maj. Gen. Edward M. McCook's Union division was assigned to re-establish Federal control and authority in Florida, whose Governor Milton had allegedly shot himself in the head rather than submit to Union occupation. Federal troops occupied Tallahassee on May 10, and on May 13, Col. George Washington Scott surrendered the last active Confederate troops in the state to McCook. On May 20, McCook read Lincoln’s Emancipation Proclamation during a ceremony in Tallahassee, officially ending slavery in Florida. That same day, his jubilant soldiers raised the U.S. flag over the state capitol building. While Tallahassee was the second remaining Confederate state capital to fall to Union forces, Austin, Texas, which capitulated in June of '65, was the last state capital to capitulate. The surrender of General Robert E. Lee’s Army of Northern Virginia on April 9, 1865, set in motion events that led to the conflict’s conclusion. News reached Florida about a week later, followed shortly by word of President Lincoln’s assassination. Shocking as these events were, Lee’s capitulation had not included Confederate units in Florida. Major General Sam Jones, who commanded Confederate forces in the state, initially called for continued resistance. He soon learned, however, that General Joseph E. Johnston was negotiating the surrender of his Army of Tennessee as well. The provisions of Johnston’s April 26 surrender included the capitulation of Confederate troops in Florida. Union Major General James Wilson ordered Brigadier General Edward McCook of his command to proceed from Macon, Georgia, to occupy Tallahassee and receive the surrender there. McCook arrived in the capital on May 10, with a final transfer of power ceremony taking place on May 20. Not until June did the final Confederates in the southern part of the peninsula capitulate Another aspect of the war’s end was the escape of various Confederate officials who hoped to reach safety in Cuba or the Bahamas by traveling through Florida. Secretary of State Judah P. Benjamin eluded his pursuers by traveling down the Florida Gulf coast and staying at the Gamble Mansion on the Manatee River before reaching Cuba. Meanwhile another group, including Confederate Secretary of War John C. Breckinridge (former U.S. vice president and cousin to Mary Todd Lincoln), likewise obtained safety in Cuba. Confederate Attorney General George Davis remained in the state for several months before attempting passage to the Bahamas in a small boat. Unsuccessful, he was forced into Key West, where he surrendered. A state convention, nevertheless, was held in 1865 to rewrite the constitution. After meeting the requirements of Reconstruction, including ratifying amendments to the US Constitution, Florida was readmitted to the United States on July 25, 1868. Although Florida families carried on with determination, significant portions of the populated areas of the state lay in ruins by the end of the war. With the conflict over, men and women, both emancipated blacks and whites, began the long and arduous task of rebuilding the state and working toward the creation of modern Florida. During Reconstruction, Florida attracted Northern capital to build tourism, but the state was not spared economic hardship. In the 1870s, the Florida legislature was forced to close the state penitentiary and halt the construction of the state's first institution of higher learning. Freedmen in Florida became landowners more readily than those in cotton states, under the Southern Homestead Act, since there was less competition for land. How important was Florida during the Civil War? Why are you interested in studying the Civil War? Was Abraham Lincoln a racist? Sources: Blakely, Arch Fredric, Anne. S. Lainhart, and Winston B. Stephens, editors. Rose Cottage Chronicles: Civil War Letters of the Bryant-Stephens Families of North Florida. Gainesville: University Press of Florida, 1998; Boyd, Mark F. 1950. The Federal Campaign of 1864 in East Florida. Florida Historical Quarterly. Vol. XXIX, No. 1; Boyd, Mark F. The Joint Operations of the Federal Army and Navy Near St. Marks, March 1865.... Florida Historical Quarterly 29 (October 1950); Broadwater, Robert P. The Battle of Olustee, 1864: The Final Union Attempt to Seize Florida. McFarland & Company, 2006; Brown, Canter. Tampa in Civil War & Reconstruction, University of Tampa Press, 2000; Brown, Canter, Jr. The Civil War, 1861-1865. In The New History of Florida, edited by Michael Gannon. Gainesville: University Press of Florida, 1996; Buker, George E. Blockaders, Refugees, & Contrabands: Civil War on Florida's Gulf Coast, 1861-1865. Tuscaloosa: University of Alabama Press, 1993; Cabaniss, Jim R. Civil War Journal and Letters of Washington Ives, 4th Fla. C.S.A. Published by the author, 1987; Civil War Trust, located online civilwar.org; Clancey, Ann Robinson, ed. A Yankee in a Confederate Town: The Journal of Calvin L. Robinson. Sarasota: Pineapple Press, 2002; Cleveland, Mary Ann. Florida Women in the Civil War. In Florida Decades--A Sesquicentennial History, 1845-1995, edited by James J. Horgan and Lewis N. Wynne. St. Leo, Florida: St. Leo College Press, 1995; Coleman, James C. (1988). Fort McRee, The Castle Built on Sand. Pensacola Historical Society; Coles, David J. They Fought Like Devils: Black Troops in Florida During the Civil War. In Florida's Heritage of Diversity--Essays in Honor of Samuel Proctor. Tallahassee: Sentry Press, 1997; Cox, Dale, The Battle of Marianna, Florida. Published by the author, 2007; Cox, Dale, The Battle of Natural Bridge, Florida Published by the author, 2007; Davis, Frederick T. Engagements at St. John's Bluff, St. Johns River, Florida, September-October, 1862. Florida Historical Quarterly, vol. 15, 1936; Davis, William Watson. The Civil War and Reconstruction in Florida. New York: Columbia University, (1913) reprint, Gainesville: University of Florida Press, 1964; Dickison, John J. Military History of Florida. In Confederate Military History, vol. 11, part 2, edited by Clement Evans. Atlanta: Confederate Publishing Company, (1898) reprint (as vol. 16), Wilmington: Broadfoot Publishing Company, 1989; Dickison, Mary Elizabeth. Dickison and His Men: Reminiscences of the War in Florida. 1890. Facsimile reproduction, Jacksonville: San Marco Bookstore, 1984; Driscoll, John K. The Civil War on Pensacola Bay, 1861-1862. Jefferson, NC: McFarland, 2007; Dyer, Frederick H. A Compendium of the War of the Rebellion (1908); Eicher, John H., and Eicher, David J., Civil War High Commands, Stanford University Press, 2001; Emilio, Luis F. 1995. A Brave Black Regiment: The History of the 54th Massachusetts, 1863—1865; Fretwell, Jacqueline K., ed. Civil War Times in St. Augustine. Reprint of El Escribano: St. Augustine Journal of History, vol. 23, Port Salerno: Florida Classics Library, 1988: Florida Civil War Heritage Trail; Fox, William F. Regimental Losses in the American Civil War (1889); Friend, Sandra. Florida in the Civil War: A State of Turmoil. Twenty First Century Books: 2002; Grismer, Karl Hiram, Story of Fort Myers, The History of the Land of the Caloosahatchee and Southwest Florida. Island Press, 1984; Hardesty, Jesse. Killed and died of wounds in the Union army during the Civil War (1915); Hartman, David and David Coles. Biographical Rosters of Florida's Confederate and Union Soldiers, 1861-1865 (six volumes). Wilmington, NC: Broadfoot Publishing, 1995; Hillhouse, Don. Heavy Artillery & Light Infantry: A History of the 1st Florida Special Battalion & 10th [Florida] Infantry Regiment, C.S.A. Rome, Georgia: Published by the author, 1992; Holland, Keith V., Lee B. Manley, and James W. Towart, eds. The Maple Leaf: An Extraordinary American Civil War Shipwreck. Jacksonville: St. Johns Archaeological Expeditions, Inc., 1993; Hurley, Neil. Florida Lighthouses in the Civil War. Oakland Park, FL: Middle River Press, 2007; Johns, John E. Florida During the Civil War. Gainesville: University of Florida Press, 1963; reprint, Macclenny, Florida: R. J. Ferry Publishing, 1989; Jones, Allen W. Military Events in Florida During the Civil War, 1861-1865. Florida Historical Quarterly, vol. 39, 1960; Kennedy, Frances H., ed., The Civil War Battlefield Guide, 2nd ed., Houghton Mifflin Co., 1998; Larkin, J. L. Battle of Santa Rosa Island. Florida Historical Quarterly, vol. 37, 1959; Library of Congress; Loderhouse, Gary. Far, Far from Home: The Ninth Florida Regiment in the Confederate Army. Carmel, Ind. : Guild Press, 1999; Loderhouse, Gary. What's in a Name? : The Attack on Fort Myers, Fla. Cape Coral, FL: Posterity Publishing, 2000; Long, Barbara L. J.J. Dickison and the Battle of Gainesville. Apalachee, vol. 8, 1978; Martin, Richard A., and Daniel L. Schafer. Jacksonville's Ordeal by Fire: A Civil War History. Jacksonville: Florida Publishing Company, 1984; Murphree, R. Boyd. Florida and the Civil War: A Short History; National Archives; National Park Service; Nulty, William H. Confederate Florida: The Road to Olustee. Tuscaloosa: University of Alabama Press, 1990; Parks, Virginia, and Sandra Johnson, eds. Civil War Views of Pensacola. Pensacola: Pensacola Historical Society, 1993; Pearce, George. Pensacola During the Civil War: A Thorn in the Side of the Confederacy. Gainesville: University Press of Florida, 2000; Proctor, Samuel, ed. Florida: A Hundred Years Ago. Coral Gables: Florida Library and Historical Commission Civil War Centennial Committee, 1965. (A day-by-day listing of Civil War events in Florida); Reiger, John E. Deprivation, Disaffection, and Desertion in Confederate Florida. Florida Historical Quarterly 48 (January 1970); Revels, Tracy. Grander in Her Daughters: Florida's Women During the Civil War. Columbia: University Press of South Carolina, 2004; Rivers, Larry Eugene. Slavery in Florida: Territorial Days to Emancipation. Gainesville: University Press of Florida, 2000; Rivers, Larry E. A Troublesome Property: Master-Slave Relations in Florida, 1821-1865. In The African American Heritage of Florida, edited by David R. Colburn and Jane L. Landers. Gainesville: University Press of Florida, 1995; Schmidt, Lewis. The Civil War in Florida, A Military History (4 parts in 6 volumes). Allentown, PA: Published by the author, 1989; Schafer, Daniel L. Freedom was as Close as the River: African Americans and the Civil War in Northeast Florida. In The African American Heritage of Florida. Edited by David R. Colburn and Jane L. Landers. Gainesville: University Press of Florida, 1995; Shafer, Daniel L. Thunder on the River: The Civil War in Northeast Florida. University Press of Florida, 2010; State Archives of Florida; Taylor, Paul. Discovering the Civil War in Florida: A Reader and Guide. Sarasota: Pineapple Press, 2001; Taylor, Robert A. Rebel Storehouse: Florida in the Confederate Economy. Tuscaloosa: University of Alabama Press, 1995; The Museum of Florida History; The Union Army (1908); US Census Bureau; U.S. War Department, The War of the Rebellion: A Compilation of the Official Records of the Union and Confederate Armies, 70 volumes in 4 series. Washington, D.C.: United States Government Printing Office; Waters, Zach C. and James C. Edmonds. A Small but Spartan Band: The Florida Brigade in Lee’s Army of Northern Virginia. University of Alabama Press, 2010; Waters, Zack C. Tell Them I Died Like a Confederate Soldier. Finegan's Florida Brigade at Cold Harbor. Florida Historical Quarterly 69 (October 1990); Winsboro, Irvin S.D. editor. Florida's Civil War: Explorations into Conflict, Interpretations and Memory. Florida Historical Society Press, 2008; Wynne, Nick and Robert Taylor. Florida in the Civil War. Charleston: Arcadia Press, 2002.